Today, cable continued to probe the 1.3750 level as shorts tried to push it past the March lows. The pair has seen a stunning turn around as it lost more than 500 pips in the last 10 days and shows no signs of bottoming out. This week brings a slew of UK PMI data reports starting with tomorrow’s PMI Manufacturing data. 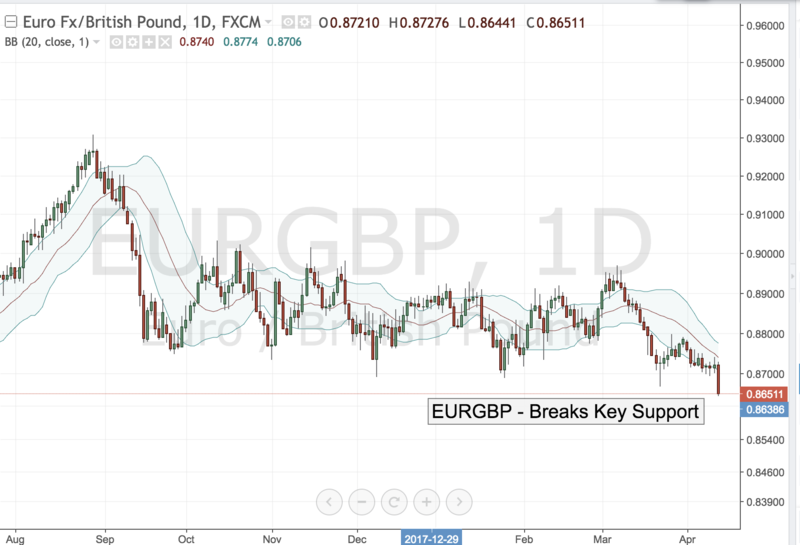 The market is anticipating a slight decline to 54.9 but if the data prints considerably worse the pound is sure to slice through the 1.3700 figure. On the other hand, an upside surprise would be a welcome relief to the bulls after so many days on one-way price action and could trigger a short covering rally back towards 1.4000 as traders reassess the risk of recession. 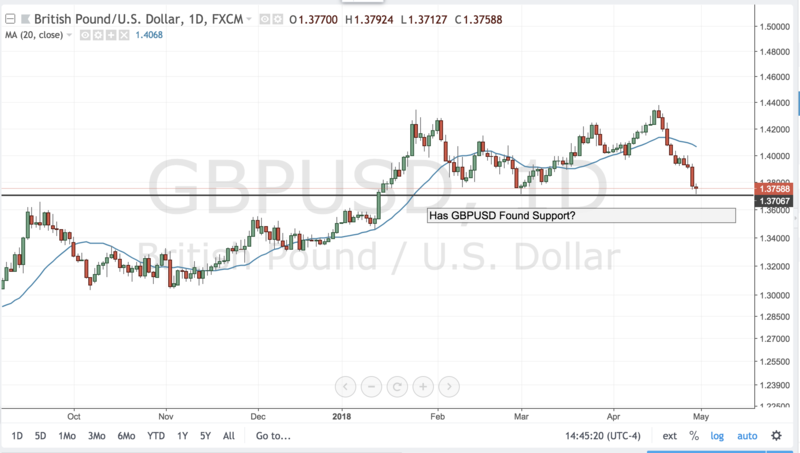 For now, GBPUSD hangs at key support as data determines its fate. 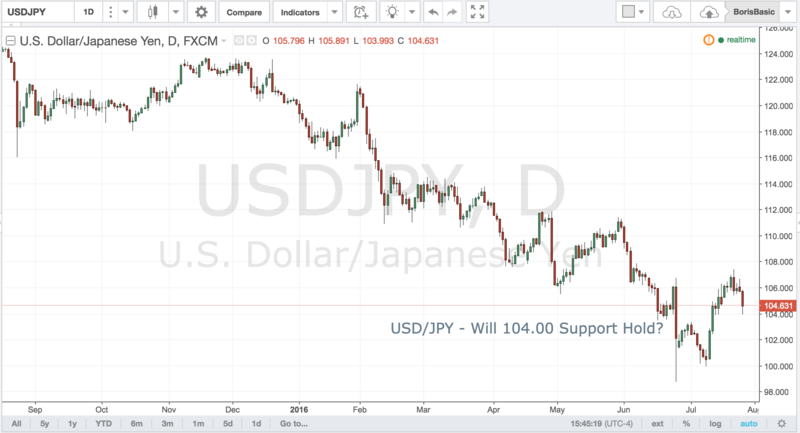 USDJPY has been under pressure for the past several weeks, having failed to take out the 115.00 figure on multiple occasions. Furthermore, the pair is failing at its key correlation with 10-year bonds not rallying when yields go up and falling when they decline. That’s a warning light for dollar bulls as a breakdown in correlation often presages a decline in price. Tommorrow the market will get a look at two key data points -- CPI and US Retail Sales. Both numbers are expected to be worse than the month prior. 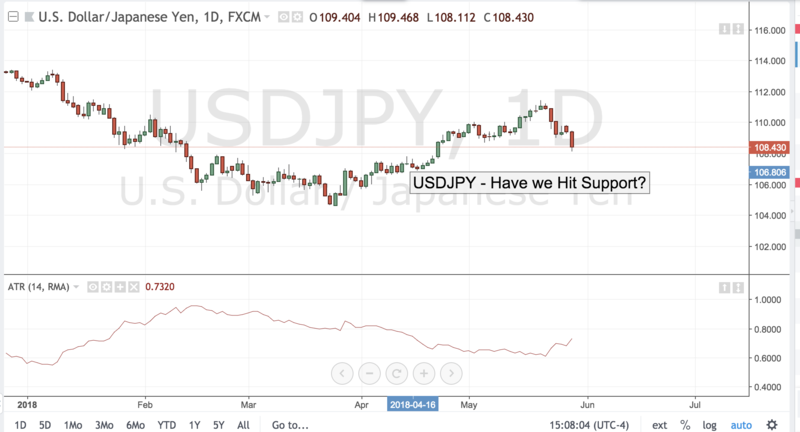 However, if they actually miss their forecast and turn negative, USDJPY will likely test the key support at the 113.00 level and a break there could lead to a much sharper selloff towards 110.00 as investors will begin to fear that US growth may have peaked. 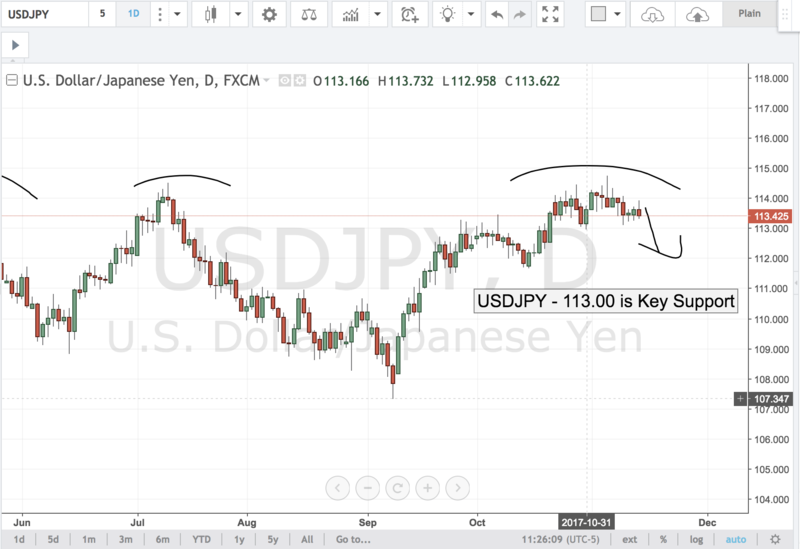 For now, USDJPY remains in a tenuous uptrend, but it must hold the 113.00 level otherwise it will have formed a very ugly quadruple top and may drift all the way to 110.00 by year-end. The collapse of oil has been the main driver behind loonie’s relative weakness this week. Crude crumbled to $45/bll level despite tensions in the Middle East as supply continues to weigh on the market. Meanwhile Canadian economy has seen mixed results with a rebound in GDP data, but softer housing and Trade Balance numbers. Tomorrow Canada will release it labor report which will be the main event risk in North American session. 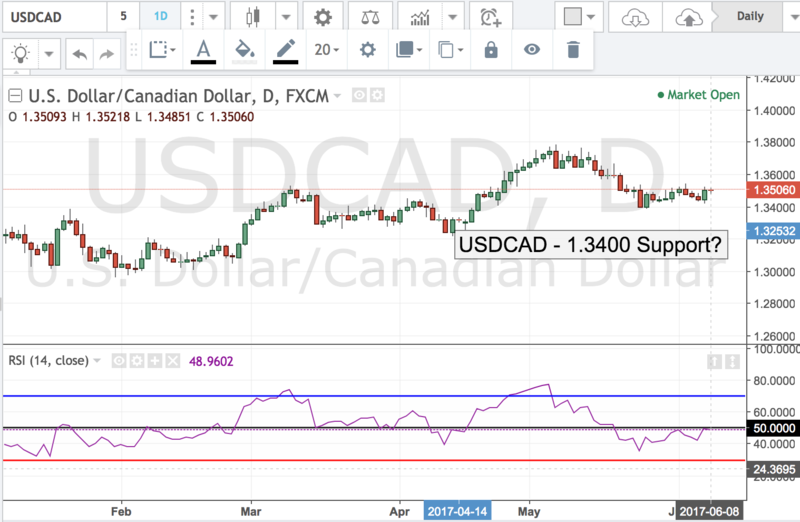 The market is looking for 11.5K gain but if the number comes in worse or even negative, the loonie could shoot for the 1.3600 figure. For now, 1.3400 is very support and the pair remains in buy the dip mode. We’re currently long AUD/NZD and thought it would be worthwhile to look at the chart from a shorter term basis. 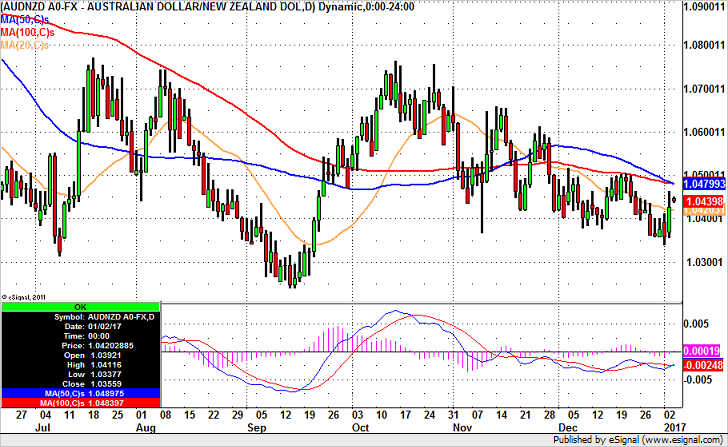 For the first time since mid-December AUD/NZD broke above the 20-day SMA. While there’s overhand resistance at 1.0480 (created by the 50 and 100-day SMA cross) the MACD is crossing to the upside and the 4 hour charts show support between 1.0400 and 1.0430. Fundamentally AUD was the day’s best performing currency thanks to the rebound in gold prices and the slide in the U.S. dollar. The AU-NZ yield spread also moved significantly in favor of +AUD/NZD. Tonight Australia’s PMI services report is scheduled for release and if the PMI manufacturing index is a guide, the data should be stronger. AUDUSD – Can Aussie Hold Support? Last night eco data out of Australia showed that the wage price index rose at 0.4% vs. 0.5% eyed while the yearly data rose only 1.9%. This was the weakest reading on record and suggested that consumer demand may be tempered. With wages and inflation muted, speculation is starting to heat up that the RBA may need to ease in near future. This has put pressure on Aussie from all sides. A cut in rates would only accelerate the carry trade liquidation move which has been in full bloom ever since US yields have skyrocketed. A rate cut by the RBA would be like adding salt to the wound as it would compress the rate differential between the two currencies even further. That’s why tonight’s AU employment data is so important. The market is looking for a rise of 20.3K jobs versus a fall of -9.8K jobs the month prior. But if the data surprises to the downside for the second month in a row, the Aussie could break the key .7450 support and fall out of it long held range to start a new downtrend move. 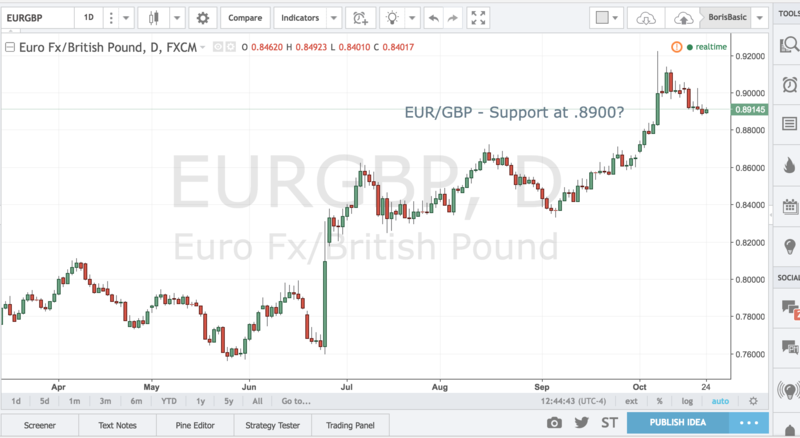 EURGBP – Support at 8900? The euro was shellacked last week post ECB presser while cable managed to hold its own causing EURGBP to drop 2 big figures off the highs. This week the price dynamics may reverse as UK eco data could sour the market on any recovery while the news out of the Eurozone could surprise to the upside. With no progress on the political front the Brexit issues hangs over the pound like the sword of Damocles while the upcoming UK GDP figures could underscore the difficulty of the new economic regime as business sentiment turns very cautious. Meanwhile, in EZ we have already seen a strong rebound in PMI data that suggests growth in the core region is picking up pace. That should provide some support for the euro and ease any concerns about further accommodation from the ECB. 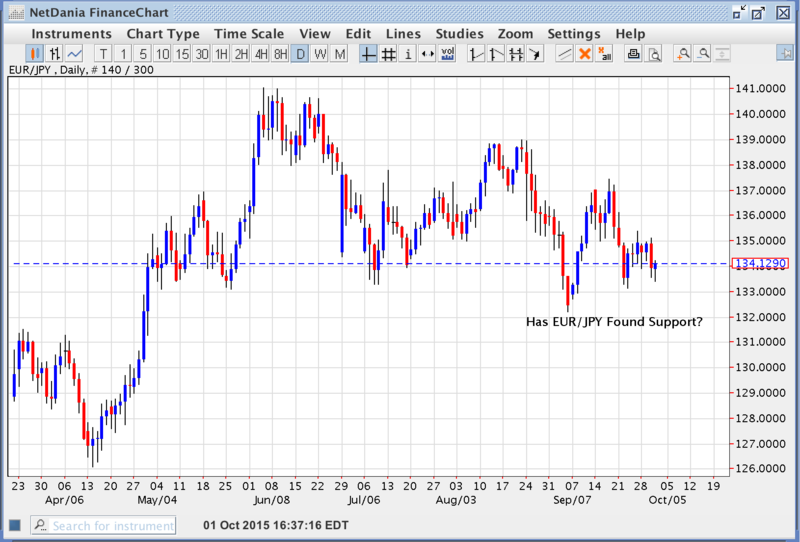 USD/JPY – Will 104.00 Support Hold? The correction in USD/JPY has been swift and brutal. As soon as the market realized that the proposed stimulus package may be a lot smaller than originally reported, the sold the pair with no mercy taking it down by two big figures before finally pausing at the 104.00 level. Having now established support at the 104.00 figure the pair could head the other way if the FOMC meeting provide tailwind for the buck. Although no one anticipates any rate hikes just yet, the market will be keen to see any change in the language of the communique that could hint at a possible rate hike in September. The US data has been surprisingly resilient and that could lead the Fed to upgrade its assessment of the economy. For now the 104.00 level is the key hold for the pair while the recent swing highs of 107.50 remain key resistance. A positive Fed release could send the pair towards a retest of those highs. 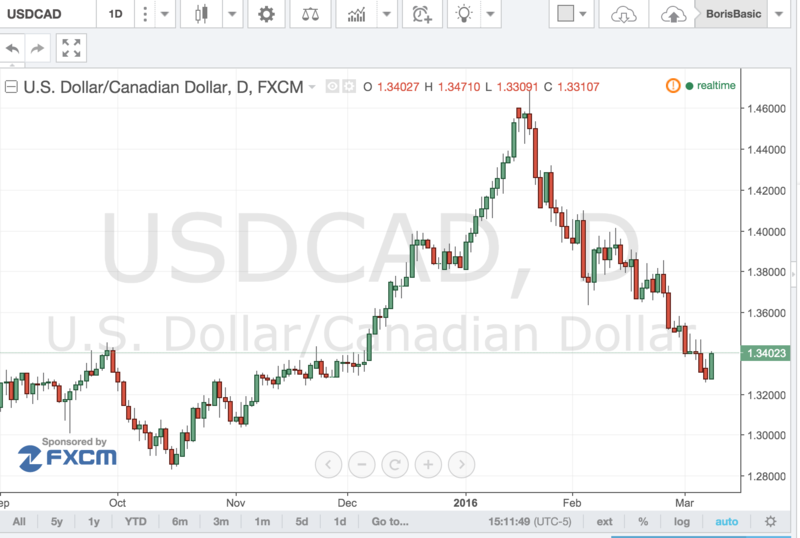 USDCAD – is 1.3200 Support? Life for the loonie has certainly been interesting The pair has essentially been on a massive seesaw ride following the price of oil both down and up. With crude having bounced off multi-year lows USD/CAD has tumbled more than 12 big figures off the highs set earlier this year. Now with crude more or less stabilized at $35/bbl the market may start to look lore closely at the fundamentals of Canadian economy. Tomorrow’s BOC meeting should provide plenty of fodder for traders with the central bank likely to present an upbeat picture claiming that the worst is behind for the Canadian economy. EUR/JPY has been a strange beast lately. In the olden days the pair used to trade on pure risk flows rising when equities rallied and falling when they declined. 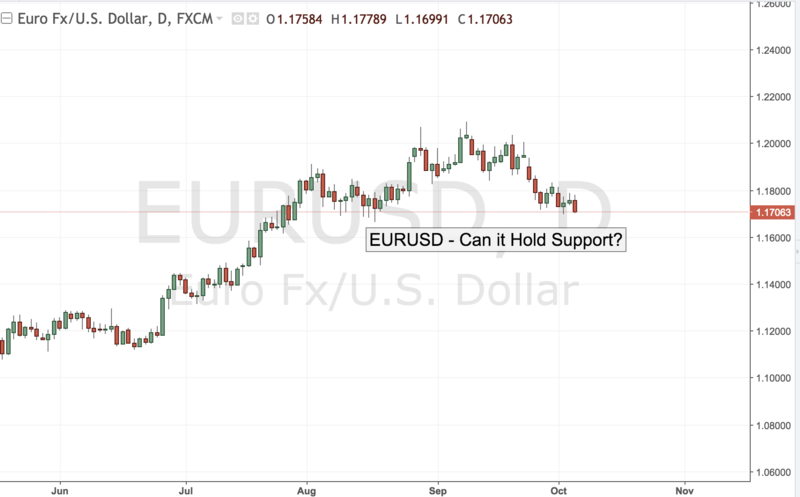 Lately however the euro has been trading in the exact opposite direction as carry trade flows have turned into risk aversion currency and as a result EUR/JPY has been in a tug of war between a rising euro and a falling USD/JPY. Of course tomorrow’s NFP report will be the key driver of trade for the pair, but there is good reason to think that payroll data meets or beats expectations EUR/JPY could rise. Stocks could weaken on fears that the Fed will be likely to jumpstart the tightening cycle but USD/JPY will likely ignore any equity selloff and will follow the bond markets which will take rates higher. Meanwhile euro will likely hold ground and may even rise if risk aversion flows accelerate and that in turn should keep EUR/JPY. With the pair looking to have made a higher double bottom the technical pattern is set up for a bounce as well.